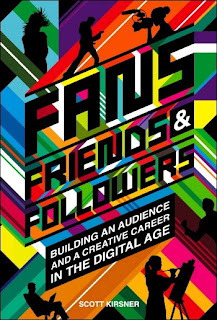 I'm really happy to report that my new book, Fans, Friends & Followers: Building an Audience and a Creative Career in the Digital Age, is now available in paperback and e-book form (both PDF and Kindle). The tools to produce films, music, books, and art have been democratized: they’re accessible and inexpensive. And the channels to distribute all sorts of creative products have also been blown wide open: today, anyone can distribute a video or a song or an image to a global audience, for free. The result is the noisiest, most chaotic marketplace that creative artists have ever known. That noise and chaos creates the two biggest challenges facing artists today: how do you cultivate a big audience for your work, and how do you leverage that audience to support your career financially? I wrote Fans, Friends & Followers to address those challenges with useful strategies, examples, explanations, and first-person success stories. Here's an earlier CinemaTech post listing the 30 artists I feature in the book. On the book's site, there's a free 35-page PDF preview that you can download to get a taste of the book. I'm *extremely* grateful to the readers of CinemaTech for all your ideas, feedback and guidance over the years... which have been really helpful in keeping me on the right track. And I thank you on the book's "Acknowledgments" page, too -- so it's official! AMC has signed a $315 million deal with Sony to deploy 4K digital cinema projectors in the U.S.
"Digital cinema gives us a huge opportunity to do 3-D, live broadcasts and playback of live events," AMC exec Frank Rash tells the New York Times. Variety notes that AMC already has 150 of the Sony SXRD digital projectors in its theatres, 29 of which also are outfitted with the RealD system for playing 3-D content. AMC's initial deal with Sony for 4K projectors happened back in 2007. Installation of this new batch will start soon, and continue through 2012. One question I have: wasn't Digital Cinema Implementation Partners formed specifically to handle these kinds of deals for AMC, Regal, and Cinemark? Where were they? This NY Times review of a new DVD of 'The Robe' is worth a look. It offers some great historical context on CinemaScope and the other widescreen technologies of the 1950s. In the early 1950s movies were in a position much like network television today. A new technology had come along — guess what? — draining away much of the audience for whom movies had been a two- or three-times-a-week habit. Hollywood scrambled to come up with something that the small-screen, black-and-white television set squatting in so many American living rooms couldn’t provide: a bigger, more sensory movie experience. A couple of initial experiments — with 3-D and the widescreen process Cinerama — produced impressive results, but proved to be too cumbersome for the basic purpose of telling stories. And then, on Sept. 16, 1953, “The Robe” had its premiere at the Roxy Theater in New York. Trumpeted as “The First Motion Picture in CinemaScope — The Modern Miracle You See Without Glasses!” — “The Robe” offered audiences an image twice as wide and significantly taller than what they had become accustomed to. I've been told by some fairly high-level execs at Disney that figuring out how user-generated content fits into the company's content creation processes is one big idea that the company is wrestling with. If this piece from today's NY Times is any indication, that initiative is proving to be every bit as challenging as the execs there expected it would be. Apparently, the Writers Guild doesn't like the idea of Disney's ABC television network asking viewers for story ideas for the new sit-com "In the Motherhood"; the show was born on the Web, where it fed off real-life tales from viewers. But ABC’s call for ideas from moms drew the attention of the Writers Guild of America, which said this type of request for submissions was “not permissible” under its contract with the network. This week ABC abruptly removed the language about “inspiration” from its Web site, effectively saying that the writers may not be listening to viewers’ ideas, after all. The last-minute changes are a telling demonstration of the differences between the Web video world — a mostly low-budget, short-form medium — and the traditional television industry. Just as most publishing companies don’t accept unsolicited manuscripts, most TV and movie studios don’t accept scripts, ideas or jokes submitted by viewers. Unless the proper waivers are signed in advance, something as innocent as a fan e-mail message with a suggested joke can provoke a copyright-infringement lawsuit later. Too bad... this puts the Writers Guild on the wrong side of innovation. I like the one in USA Today best. But there's also this Wall Street Journal piece. Of North America's nearly 40,000 screens, about 2,000 will be 3-D capable in time for Monsters— thousands less than [DreamWorks Animation CEO Jeffrey] Katzenberg predicted last year. That means fewer chances to charge an extra $3 or more a ticket to see the atomic-age-inspired romp in all its extra-dimensional cheesiness — a premium that audiences have been glad to pay in the past for such movies as 'The Polar Express' and 'Journey to the Center of the Earth.' 'Monsters vs. Aliens' also will be available in standard 2-D on multiple screens at about 1,400 locations. Katzenberg thinks that is enough to cover the $15 million or so the process adds to a film's budget as well as make a profit, especially given the recent surge in theater attendance. But he seems less concerned about whether 'Monsters,' budgeted at an estimated $165 million, conquers the box office than he is about 3-D taking over the planet. Almost every movie would benefit from being 3-D, the way nearly every movie benefits from being in color," he says, though the format has been best served by animation so far. "When James Cameron comes forward with 'Avatar,' it will mark a whole new era of live-action films. When other filmmakers see what he has done, they will want to use it." The WSJ piece misses the point that eventually, with 3-D displays in the home, that will create a nice "aftermarket" for all these 3-D movies the studios are making. The recording is about an hour long. Here's the MP3 audio, or you can just click play below. Continuing the CinemaTech tradition, I'm posting two-sentence reviews of the films I saw while at SXSW this week. - "RiP: A Remix Manifesto"
Brett Gaylor's energetic and fast-moving documentary asks whether we need to rethink the way creative products are copyrighted, with the goal of fostering more creativity. The film has a strong point of view, and dissenting voices aren't really heard from, but "RiP" seems like just the thing to spark a very important conversation about the laws surrounding intellectual "property." Tom Luckey is a Connecticut architect who is paralyzed when he falls out the window of a house he designed. Laura Longsworth's near-perfect documentary explores in a deep and touching way how the accident changes his relationship with his wife and son, who steps in to help with Luckey's architecture practice, and the only flaw is that this very engaging film comes to a bit of a screeching halt at the end, stopping just before two very crucial events happen. If you imagine Travis Bickle as a mall security guard, and "Taxi Driver" as a comedy, you'll have a bit of a sense of the weirdness that is "Observe & Report." Maybe Seth Rogen is so popular he can do no wrong, but I found the lack of consequences and one-dimensional characters to be dull and unfunny, and I stopped caring what would happen next about half-way through. I took just a few notes while I was moderating yesterday's SXSW Film Fest panel on 'The Future of DVDs and Digital Distribution.' It was populated with execs from New Video (one of the biggest funnels that gets indie films onto iTunes), Cinetic Rights Management, and SnagFilms, but the folks who really made the panel, I thought, were filmmakers Gary Hustwit and Morgan Spurlock. Unlike most of these panels, where people talk in generalities, this time we got some specifics about where we are today. Hustwit and Spurlock and the other panelists seemed to agree that even if you can get your film placed on a few of the big digital marketplaces, such as iTunes, Hulu, Snag, and Netflix's streaming service, you'll do well today to earn about one-tenth the revenue that you earn from DVD. They seemed to agree that there's about a 90/10 breakdown today, in terms of the ratio of DVD revenues to digital. Hustwit said that 'Helvetica' has earned about $60K in digital revenues so far... and it's among the top ten documentary rentals and downloads on iTunes. Spurlock's film 'Super Size Me' is among the most popular films on SnagFilms, the site that sells advertising around documentaries and shares a slice of the money with filmmakers. Yet he said that 'Super Size Me' and 19 other films he'd supplied to the site earned just $1,200 from Snag over a two-month period. 'Super Size Me' alone sold almost 70,000 DVDs in the last quarter of 2008, he said. "If you’re looking to pay your rent [with digital distribution], not so much," Spurlock said. "But if you’re looking to pay your phone bill, you have a great chance." Steve Savage from New Video and Matt Dentler from Cinetic Rights Management also shared a bit about the fees they charge filmmakers when they assist with digital distribution on various platforms. After the platform takes its cut (iTunes takes 30 percent of revenues, for instance), New Video takes about 15 percent more... and Cinetic takes a 25 percent fee. Hustwit was quite vocal about urging filmmakers to take the DIY approach whenever possible." Why are we building other people’s businesses when we could be building our own," he asked. But even he relies on New Video to get films onto iTunes. I asked Savage what the #2 digital marketplace is, after iTunes. He said it's Microsoft's Xbox gaming platform. I asked Rick Allen, CEO of SnagFilms, whether he could share with us the percentage of people who watch streaming films on Snag and later go on to buy the DVD. He said there isn't a good average, but that less-well-known films tend to have a higher "conversion rate" for DVD sales than some of the bigger name docs on the site. Here's some coverage of the panel from Web TV Wire... IndieWire (owned by SnagFilms, incidentally)... Scott Macaulay at Filmmaker Magazine. I've just received some early copies of my forthcoming book, Fans, Friends & Followers: Building an Audience and a Creative Career in the Digital Age, which will be available very soon in two forms: digital and ink-on-dead-trees. So what better time to share with you the table of contents? The heart of the book consists of thirty interviews I conducted over the past year or so with filmmakers, musicians, animators, writers, cartoonists, comedians, etc. I conducted a number of interviews that didn't end up in the finished book, and eventually I'll share some of those here. But when I started punching in the names of some movies that were listed on sites like Hulu or iTunes, and got a "no matches found" message, I e-mailed founder Reid Rosefelt to see what was up. Were they adding movie titles by hand, or finding all the movies automatically on various movie sites, the way Google finds Web pages for its search engine? It’s a demo and yes, the data was put in by hand. ...[But] the real data input will be done one company at a time and will be automated. They’ll give us their data and it will flow in. The technology for transferring lots of data is easy; the only issue is getting the websites to agree. And I’ll be having meetings over the coming months to accomplish exactly that. When I’m convinced that enough data is in it, then the word DEMO goes down and BETA will go up. I'm not sure you actually need permission from Hulu, say, to have your software go to this page and create links to all of the features the site currently offers. That's the sort of "spidering" that Google and many other search engines do every day. But media sites can be strangely cranky about people creating more links and access to their content. it'll be interesting to see how Rosefelt's plan plays out. A truly comprehensive index of all the movies available on various sites would be a great thing. What is the Worst Possible Mistake You Could Make on Your Film's Web Site? I stumbled across a trailer for the film on the New York Times site today. At the end of the trailer, they direct you to the film's Web site, EveryLittleStepFilm.com. Then you get to the Web site. Is the film in release now? Being released? Is it available on DVD, or coming out soon? Is it on iTunes? All you are told is that it played in 2008 at the Berlin Film Festival and the Toronto International Film Festival. Even if you as the filmmaker or distributor knew absolutely nothing about when the film was coming out theatrically or on home video... why wouldn't you give me a way to stay in touch, by entering my e-mail address or joining your fan page on Facebook, so that you could notify me when the film is out? This is just about the dumbest thing you could do on your movie Web site. It's akin to buying a full-page ad in the Yellow Pages and forgetting to include your phone number. There's just no way for the visitor to take action and express an interest in eventually seeing the film. If I'm interested in seeing 'Every Little Step,' Sony Pictures Classics has got to hope that I'll see another ad for it once it's released, notice the title on my local arthouse's marquee, or happen across a review that lets me know it's finally out. Why take that chance, and why spend all that extra money and effort? As a counter-example, check out the site for another doc, RiP: A Remix Manifesto, by my pal Brett Gaylor. You can sign up to "attend" Facebook events they've created for each of the film's screenings, subscribe to an RSS feed that lets you know about the film, follow them on Twitter, or enter your e-mail address in a box that says "Keep me posted." Chatting with the manager of one of my local theaters, the Showcase Cinemas in Revere, I asked him how business had been -- given the general economic malaise we seem to be mired in. I was there on a slow Wednesday night, so it was hard to tell how things were going. But Ken told me that he was astonished at how busy they've been. He said there have regularly been weekend nights lately that felt to him like mid-summer. Then, a few days later, the New York Times published this piece, noting that ticket sales and attendance are up by 16-17 percent so far this year. In 1982, theater attendance jumped 10.1 percent to about 1.18 billion (the top seller was “E.T. : The Extra-Terrestrial”) as unemployment rose sharply past 10 percent. Then admissions fell nearly 12 percent, an unusually sharp drop, in 1985 (the “Back to the Future” year), as the economy picked up — suggesting that theater owners have sometimes found fortunes in times of distress, and distress in good times.